Ms. Gordon has been practicing Dermatology for over 10 years and has been employed by the Atlanta Center for Dermatologic Diseases for the past 5 years. 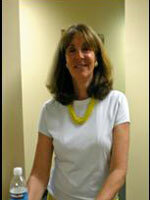 She also has experience in Oncology, Ophthalmology, Rheumatology and Orthopedics. Bachelor of medical science from Emory University 1976, graduated from Emory PA Program December 1976. Recertification every 6 years, last Recertification 2007. She has maintained active memberships in the AAPA, GAPA and GDPA.